Patented thermal slots ensure maximum heat transfer to maintain consistently warm room temperature while perfectly sealed oil reservoirs need no refilling. The unit is a bit bulky. Though DeLonghi oil heater looks somewhat old-fashioned, it offers the functionality that goes far beyond classic old radiators and makes it by far the best space heater for larger rooms. Producing no noise, it's a perfect match for bedrooms and nurseries. Besides, in the long run, it will help you save your budget on energy costs without sacrificing your comfort during the cold season. A tower design paired with a widespread oscillation option will ensure even heat distribution in all directions to efficiently heat up an entire room in minutes. The fan might start working louder in several weeks and needs regular cleaning. Efficient, functional, taking up minimum space thanks to a small footprint, stuffed with a variety of programmable functions, and featuring a remote control, this model is one of the most convenient in use. It will quickly warm up a middle-sized room and maintain the ambient warmth as long as you need. Not only does this fan heater provide several operation modes and a number of safety options but also it brings the benefit of compact storage, thanks to a cord compartment on the back panel. The tip-over switch is too sensitive. Pairing an oscillation feature with fan functionality, this small ceramic heater from AmazonBasics is the best choice for small areas. It can quickly heat up the space and deliver both targeted warmth or chilly airflow, depending on your needs. Plus, it is available in two color combinations - silver and black - so you can choose one that will fit your home design. Thanks to 3 available heat settings and an adjustable thermostat, you can customize the heating mode to meet your needs and optimize the energy consumption at the same time. Fan-only mode is not available. Though this model does not differ too much from similar compact fan heaters in terms of power and dimensions, it can quickly and, what is more important, evenly warm up the air in a middle-sized room. Such high efficiency is ensured by the patented Vortex™ Technology delivering uniform heat throughout a room. Looking rather like a piece of decor than an electric appliance, this model boasts an impressively large coverage area of 1000 square feet almost no other heater within 1500 wattage rage can offer. The unit might seem somewhat costly. With the power of only 1500 watts, the Dr. Infrared Heater DR 968 can handle the areas that normally require a much more powerful unit. Hence, it will help you slash your energy bills in half for sure and can even make an alternative to a central furnace. Besides, it provides a lot of configurable features for your comfort and will become a stylish addition to any interior. The DeLonghi EW7707CB is an oil-filled radiator, a type of space heaters considered one of the most efficient and safest so far. Made up by several steel columns filled with oil, this radiator resembles a conventional hot-water radiator that is normally part of a central heating system. In fact, oil heaters bring the main benefit of the latter as well. It’s an ability to retain and emit heat long after the power is switched off. Just like hot water, once heated, the oil will slowly cool down still generating heat into the air. 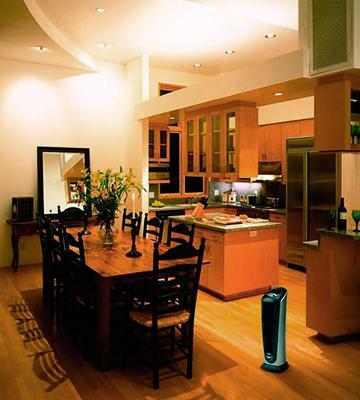 This very peculiarity makes the DeLonghi oil heater an ideal choice for maintaining consistent heat in pretty large rooms over 350 sq.ft. Though a radiator design looks somewhat old-fashioned and cumbersome, the modern functionality and some handy updates it offers put this model high above classic old radiators. First off, ideally sealed steel columns safely keep hot oil inside removing the risk of leakage and the need to refill. 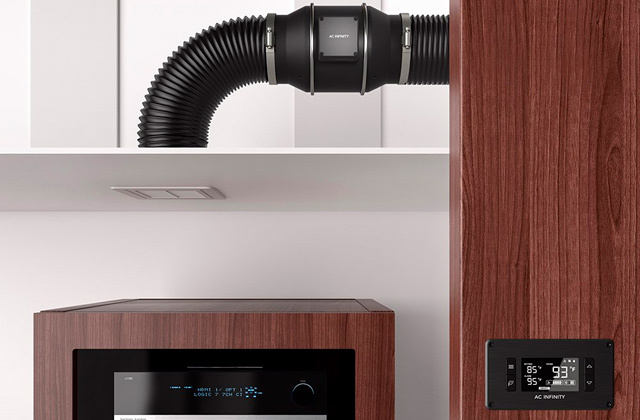 Besides, known for their striving for innovations, DeLonghi has redesigned traditional radiator columns and fitted them with special thermal slots to direct the heat flow upwards. This little trick maximizes the heat distribution and allows the columns to stay cool to the touch to prevent burns in case of contact with skin. To freely move a pretty heavy unit around the house, it comes fitted with patented caster wheels which roll smoothly on any surface. The power of 1500 watts is more than enough to quickly heat up the oil and continuously maintain a comfy level of warmth in bedrooms, playrooms, TV rooms, nurseries, dens, and other medium- to large-sized rooms. You can also use it for a basement, garage, or workshop where extra heat might be needed from time to time. 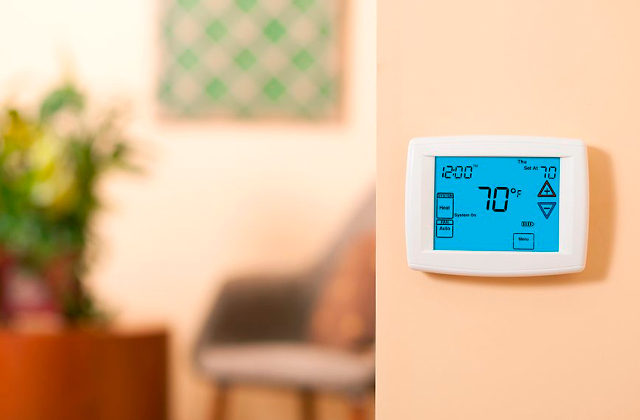 An adjustable thermostat in a combo with three available heat settings will let you tailor the heating mode to your needs and comfort while a ComforTemp option will maintain an optimal room temperature and help minimize energy costs. In addition to high heating performance and solid design, the DeLonghi oil heater has one more merit many other space heater types lack, that is quiet operation. Units using fan-assisted convection often appear pretty noisy. Meanwhile, DeLonghi heater produces no irritating noise. The only sound it generates is a kind of click when cycling on and off. Yet, once it heats the oil up to the set temperature, it won’t turn on too often since the oil will retain the heat for long. 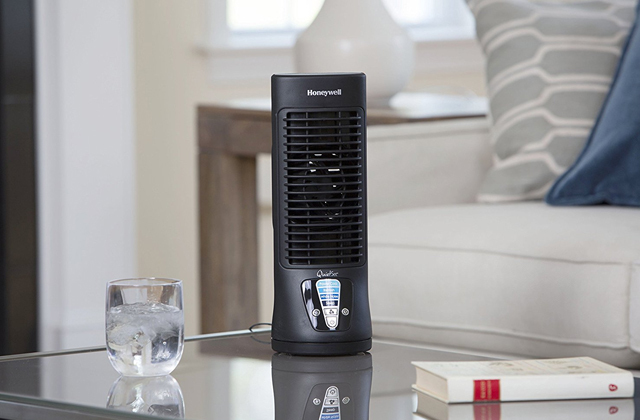 Silent operation makes DeLonghi heater by far the best choice for sleeping areas so that fan blowing and rattling won’t disturb you when you have rest. 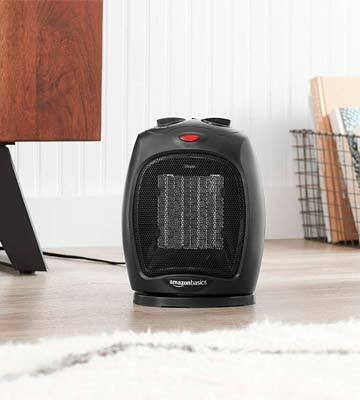 If you're looking for a functional space heater that needs no maintenance, incurs no extra energy costs and will serve you for years to come, the DeLonghi oil-filled radiator is by far the best option to go for. It offers time-proven quality for your comfort. If you need a reliable, efficient, and easy-to-operate space heater that will take care of your comfort during cold spells, you follow the right track. 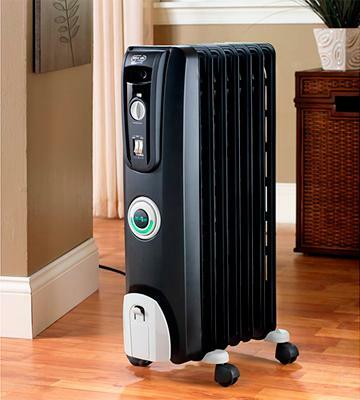 With the Lasko 751320 room heater, you will feel cozy and warm at home no matter how cold it is outside. Lasko is a recognized industry leader in terms of product quality and performance. This model is not an exception. 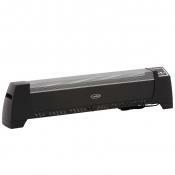 It comes encased in a body made of highly durable and strong plastic resistant to heat and damages. Behind a grill is a sturdy ceramic heating element not prone to overheating and distinguished by long service life. The unit design is thought out to every detail as well. A tower shape with a small footprint will ideally fit into tight spaces and concise areas. Taking up minimum floor space, the heater will find its place in any room and won’t become a tricky obstacle on your way. 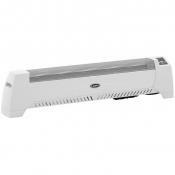 Along with a quality built, the model also offers up-to-par heating performance. A 1500-watt elongated heating element generates consistently high heat while a fan with a penetrating air velocity pushes warmth outside. Meanwhile, a widespread oscillation option ensures uniform heat distribution in all directions to quickly infuse the air with a delicate heat. Yet, what makes the Lasko 751320 especially attractive for customers is the comfort and convenience you’ll enjoy when using it. 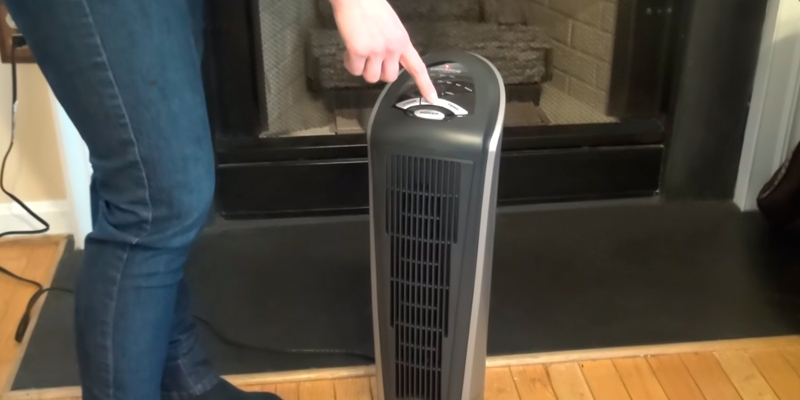 Unlike most space heaters with manual controls, Lasko comes complete both with intuitive button controls on the top and with a remote. It means if you suddenly need to change the heating settings when you’ve already made yourself snug on a couch or in a warm bed, you don’t have to get out of your cozy net nest and can do it remotely. For your ultimate comfort, the appliance offers two variable blowing settings and six temperature settings from 60 to 85 degrees to customize the heating mode depending on the room temperature and weather conditions behind the window. 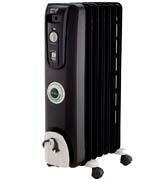 The biggest safety concern about space heaters is the risk of fire in case of the unit overheating or tipping. However, to save your peace of mind, the manufacturer fitted this ceramic heater with all the essential safety options. A ceramic element boasts a temperature self-regulation feature that prevents overheating. And if it starts to overheat, the built-in thermostat will automatically shut the unit off. The same will happen if it accidentally tips over, an important safety feature, especially for families with fidgety kids who run around the house all the time. To avoid the risk of fires during operation, leave enough space around the heater for proper ventilation and never cover it. With the above said, the Lasko 751320 is a reliable and safe added source of heat that will quickly warm up a middle-sized room and maintain the ambient warmth as long as you need. Thermostat works quite well and unit will shut off and on as needed. Our living room is 20 feet long and about 25 feet wide. It opens up to a large hallway, and during the winter time it can get freezing downstairs. We had a cold snap roll in, and so we turned this space heater on. Within 10-20 minutes we could already feel the air getting warmer inside the house. It has a good height. It's not one of those heaters that direct the heat to your feet first. 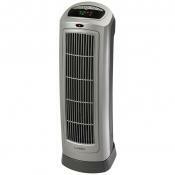 When choosing a space heater there are some basic characteristics you rely on and a quality unit is expected to have. These are ease of use, adjustability, and efficient heating performance. With a ceramic heater from AmazonBasics, you’ll get those basics and even some more, all at a fairly affordable price. See for yourself. Packed in a body made of durable black plastic and featuring a sturdy mesh grill, the unit can easily withstand extensive use, no matter if you put it on the floor or somewhere above. Even if you suddenly drop it or it falls on the floor, it won’t chip, crack or break. Seemingly simple and fitted with manual controls, the AmazonBasics compact ceramic heater offers a fully customizable operation. An indicator light will let you know when the unit is plugged in. One of the control dials allows selecting between three blower options. It has a standard high blowing intensity to heat up the air in the room more quickly and a low setting to maintain the heat or gently blow the air around you when using the unit as a personal heater. 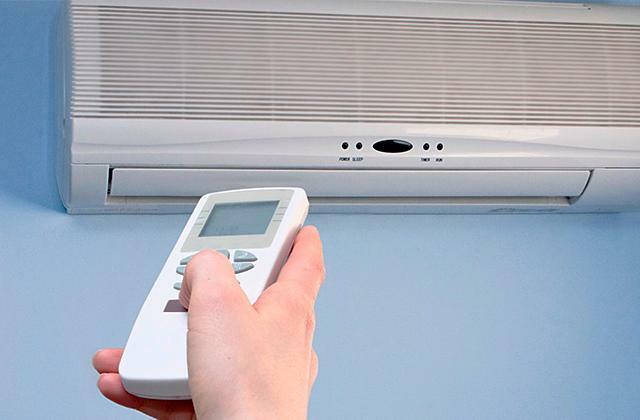 The third blowing option is a fan mode in which the appliance will only activate a fan to circulate the ambient air for a cooling effect without turning the heating unit on. The second dial is meant purely for air temperature control. By turning it clockwise or counterclockwise, you can set a thermostat from high to low and vice versa in incremental steps. The heater will maintain consistent heat according to the settings. However, if the room temperature is higher than a thermostat setting, the heater will not turn on. It will start heating only when the thermostat senses the temperature has dropped below the setting. 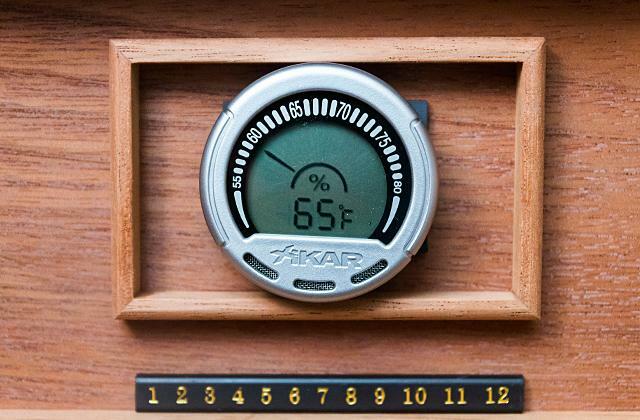 This little smart feature will let you avoid energy overuse and the air overheat. 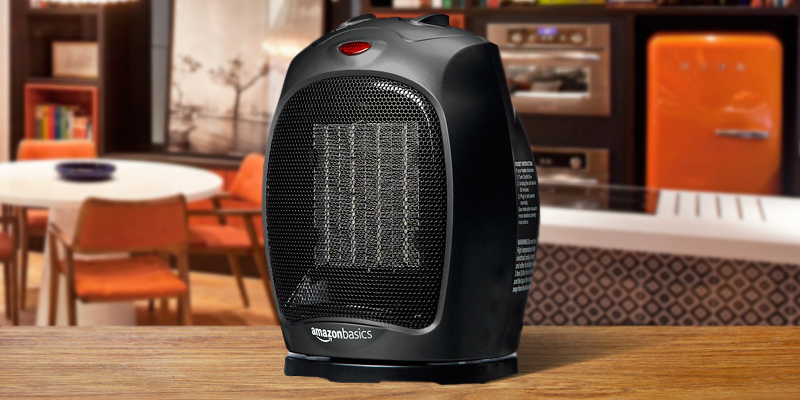 At the price tag twice lower than that of top-rated models, you’ll hardly find a heater that provides more than basic functionality, unless it’s a portable ceramic heater from Amazon Basics. In addition to the basic features we have already mentioned above, this model also offers some added little merits. 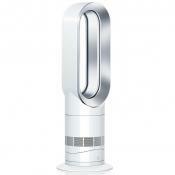 Thus, it boasts an oscillation option, which is typical of more expensive models, to evenly disperse the heat in different directions and warm up the whole room more quickly. Other than that, it also provides a tip-over switch that will automatically shut the unit off in case of tipping over, thus, preventing overheat and excluding the risk of fire. This very feature is of great importance for families with kids and pets bustling in and out. There is more to come. 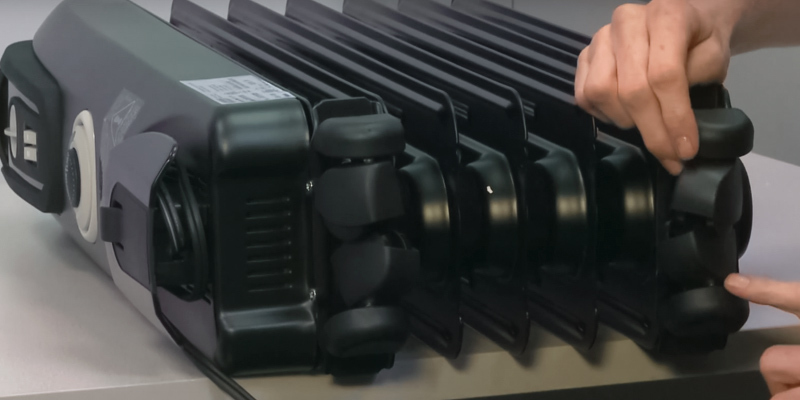 A compact power cord compartment on the back panel will ensure the benefit of compact storage when the unit is not in use. Affordable yet functional and offering a number of premium features, the AmazonBasics is an optimal budget model for students and those who reside in rented households and apartments as well as for anyone who need targeted warmth on cold winter days. 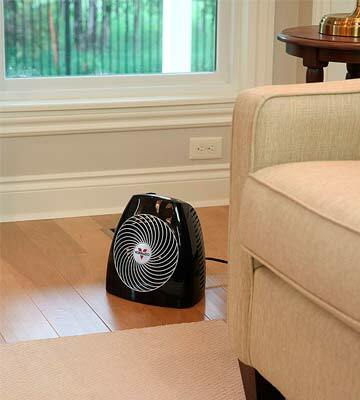 Fan heaters, which are a type of space heaters, normally come in a compact design and are predominantly intended for small rooms. They will hardly cope with larger areas and spaces that are usually covered by bigger air warmers. Yet, wouldn’t it be nice to have the heating performance of bulkier models in a miniature design? This is what you will get with a fan heater from Vornado. One of the downsides of high-efficiency tower heaters and cumbersome radiators is that they are awkward and somewhat inconvenient to carry, even though fitted with wheels and carry handles. 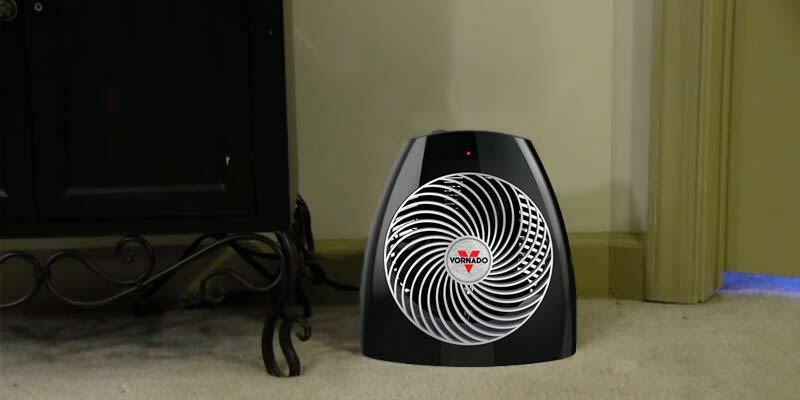 The Vornado MVH is a lightweight little heater with a low profile and small footprint. Not only can is it small enough to be positioned just about anywhere (on the floor, under the table or on top of it) but also it is truly portable to be carried without a hassle. 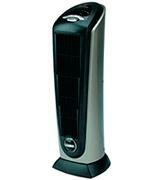 Despite its compactness, the Vornado is distinguished by a really high heating efficiency not typical of fan heaters. 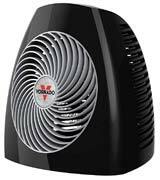 While other 1500-watt air warmers often produce a directed hot puff of air and can heat only small spaces, the Vornado provides voluminous air heating. The unit can warm up a middle-sized room up to 300 sq.ft. very quickly and, what is more important, evenly. All of this is owing to an innovative patented Vortex technology this model comes fitted with. 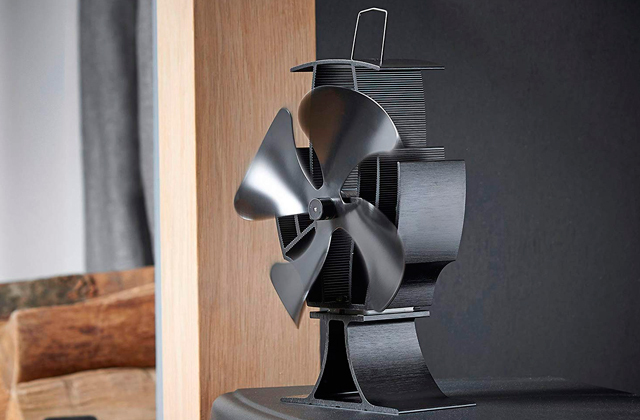 A unique design of fan blades reminding that of an airplane propeller ensures efficient air circulation and uniform heat distribution in all directions filling the room with ambient warmth. 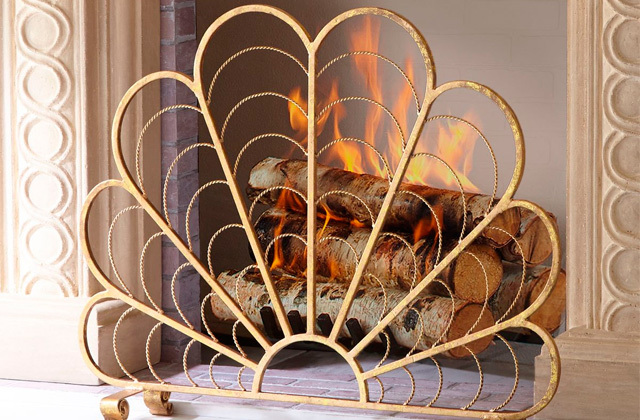 Hence, whether you put it in a small den or in a master bedroom, the heater will warm it up in mere minutes and then will cycle on and off maintaining the desired level of warmth. 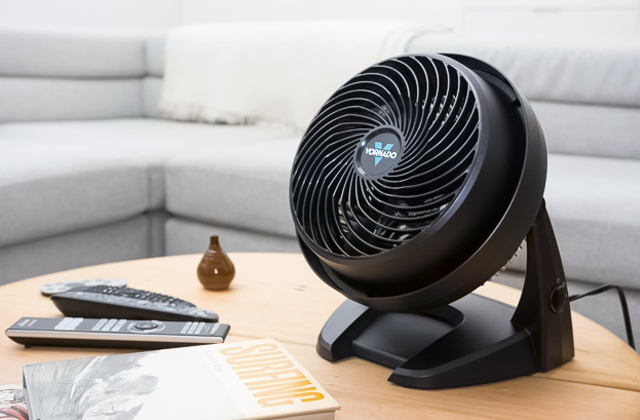 Aside from impressive heating efficiency, the Vornado MVH has something more to offer. When we say it we mean the performance adjustability making this model more versatile than you might think. 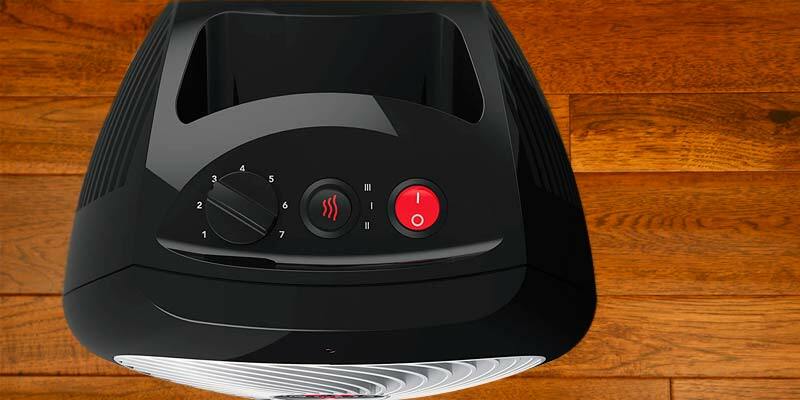 Three selectable heat settings of 750 watts, 1125 watts, and 1500 watts accordingly will let you choose the desired heat output while an adjustable thermostat allows setting and continuously maintaining a comfortable heat. Thus, you can precisely tailor the heating performance to your individual preferences and to the room area in question. Go for higher heat and wattage settings to quickly achieve the desired level of comfort in a larger room and then turn to a low blowing intensity to maintain warmth in an energy saving mode. With this level of user control, you can use Vornado for heating an entire room or just a confined space for an individual. Put it in a nutshell, if you need a compact yet capable and reliable heater to warm up your workplace or efficiently heat a room from wall to wall, the Vornado MVH will definitely fit the bill. There are things, items, and appliances that might seem a bit pricey, given their intended purpose. But in practice, they quickly pay off and bring you much more than you’ve expected. 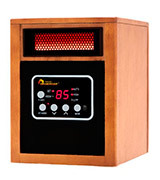 The Dr.Infrared Heater is one of such units. 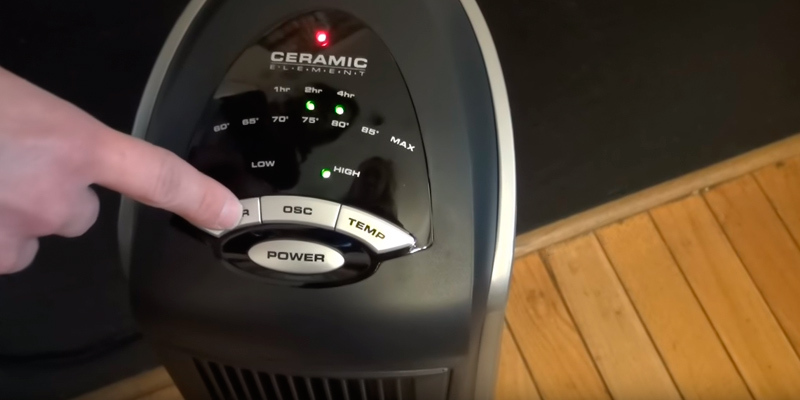 Though a price tag of this model is a bit high for an ordinary electric space heater, you’ll be surprised how much it can offer. In terms of power, this model belongs to average capacity 1500-watt heaters designed for areas up to 250 square feet to the maximum. Not the sharpest knife in the drawer, right? However, in practice, the unit can efficiently heat up the area of up to 1000 sq.ft. That’s impressive. And what’s the trick behind? No magic engaged, it’s just a well-thought combo of infrared heat and a convection technology that allowed squeezing maximum heat output from a mid-range wattage. A dual heating system with infrared quartz tubes and PTC consistently heat while a high-velocity blower forces heat into the environment twice quicker than competitor models, thus overperforming the rivals and delivering 60% more heat. A rotating blower dissipates the heat in all directions to fill your room with mild and uniform warmth without hot air blasts and cold spots. This way, the DR 968 can handle large areas and quickly heat up living rooms, dining rooms, and kitchens and will let you reduce your central furnace output to the minimum to cut energy costs in half. More than that, the model also has an automatic energy saving mode to further reduce electricity bills. As functional as it is, the appliance is a breeze to use and incurs no safety concerns. 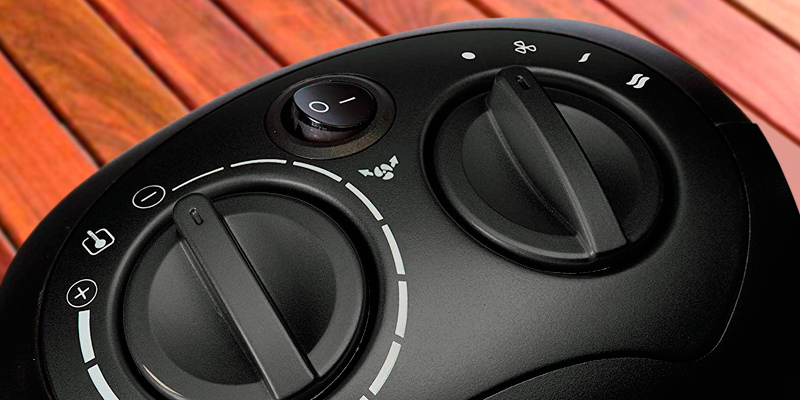 You can use either manual controls or a remote to adjust the heating mode to your comfort. A timer option allows selecting the operation time between 1 to 12 hours and small wheels will let you easily move the unit between rooms if needed. The features ensuring safe operation free from fire hazards include an enclosed heating element, cool-touch body, overheat cut-off, and tip-over protection. 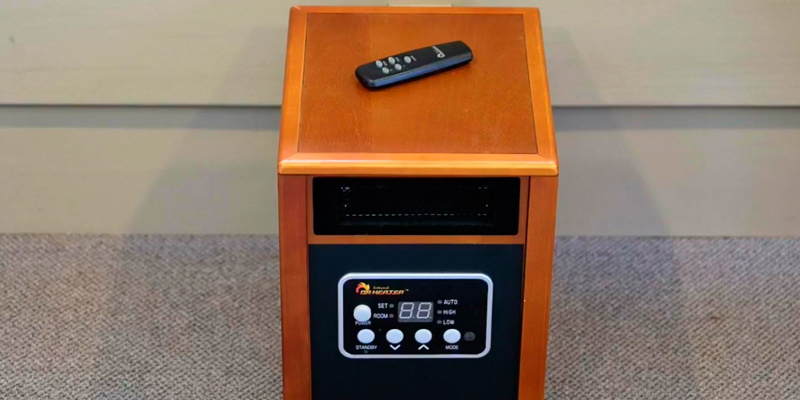 What sets the Dr. Infrared Heater apart from other space heaters is its distinctive design. 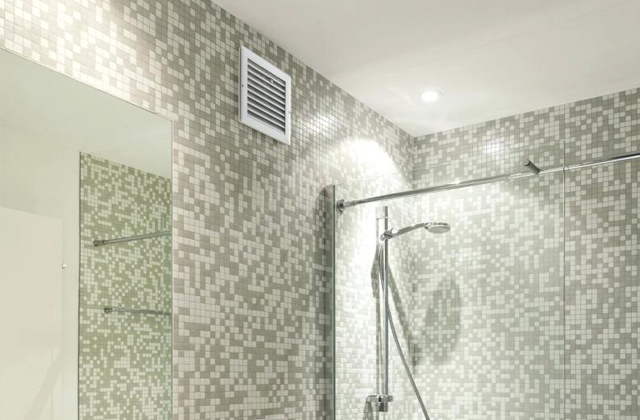 At a glance, the unit doesn’t actually look like a heating unit or a traditional radiator. Packed in a wooden body with a polished black control panel and a glowing heater grill above it, the appliance rather reminds an old radio receiver that was a part and parcel of household interiors back in the 1920s and is an obsolescent item today. However, this kind of design looks classy and eye-catching. It will add an elegant vintage vibe to any interior and perfectly match any style from industrial loft to modern classics. To sum up, the DR 968 room heater will easily handle the heating performance of more powerful units and blend with any interior. It’s an energy efficient model that will become a real find for large rooms while two or three units can even make a decent alternative to a central furnace. As cold weather is coming to the countries of the northern hemisphere, people start to huddle up near the fireplace or in their beds. And if the central heating is insufficient a space heater will be extremely useful. This handy appliance can be used almost everywhere - to heat up the air around your desk at work, warm up your room at home, make the air warmer in your cozy small store, warm up your garage or workshop, and so on. Space heaters are designed as added sources of heat, and when used wisely, they won’t increase your electricity bills and will even help you optimize your energy costs during a heating season. Space heaters might become a real budget saver for owners of large houses with numerous rooms since they will cut the need to crank up a central furnace when it gets colder outside and will let you add some warmth only in those rooms where you need it. 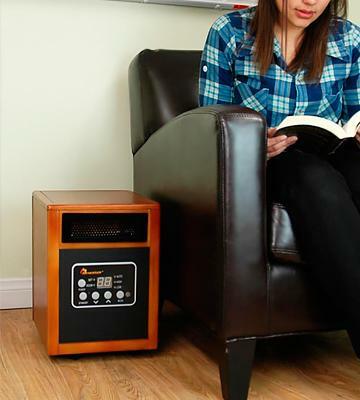 Just make sure you choose a space heater to your needs and it will keep you toasty throughout chilly days. To further minimize your energy expenses and maintain a comfy environment in your dwelling, we also recommend turning your eyes to thermostats. These smart home systems are designed to adjust a favorable climate indoors all year round through automatic HVAC system control. Though space heaters are pretty simple units, they come in a great number of sizes, shapes, and designs that can make your head reel. Hence, there is a basic set of features to check and pay your attention to before making a purchase. Electric space heaters are classified by the heating technology applied and by the mechanisms used to heat the space, all types having their benefits and best suited for certain conditions. Convection heaters. These are by and large compact and portable units using hot air circulation to heat up the air in the space. 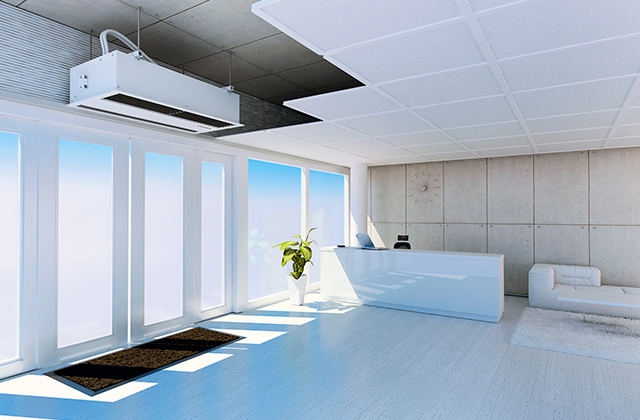 They use fans to blow out heat generated by a heating element and circulate hot air around the room. 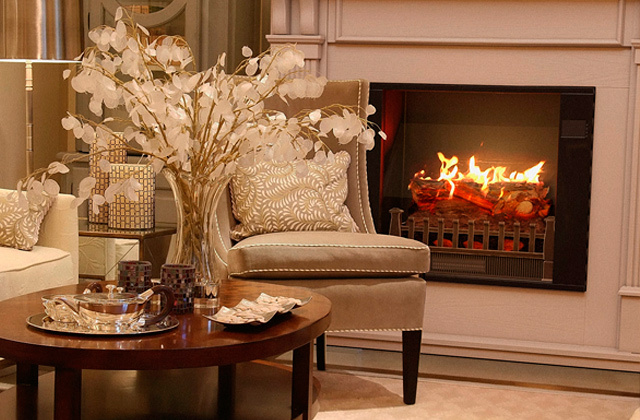 Fan-forced convection heaters are the best option for entire room heating. Radiant heaters. This type rather warms objects than air and delivers direct heat. It will efficiently warm some specific area and come in handy when there is a need for targeted heat. 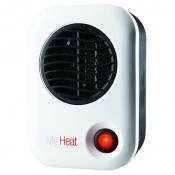 Micathermic heaters. It’s a kind of combination units using both radiant heating and convection. 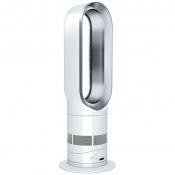 Yet, they apply natural convection instead of fan-assisted technology that makes this type much quieter than the rest. Coil heaters use a metal coil or wiring to generate heat. They can produce pretty much heat yet this type is prone to failures due to overheating and is not the safest option. Ceramic heaters come equipped with ceramic heating elements that are self-regulating and can automatically reduce their temperature preventing overheat and prolonging the unit service life. Oil radiators use diathermic oil to transfer heat. They consist of several metal columns filled with oil. The oil is heated by a heating element from the bottom and naturally circulates around the columns exuding heat into the air. Infrared heaters are another type of radiant heaters using quartz tubes to radiate heat and transfer it to surrounding objects. The area a certain heater can cover depends on the heater power and type. Thus, coil and ceramic heaters do a great job for small areas and personal spaces while oil-filled heaters are the best option for large rooms. Infrared units are a great source of personal heat and can be used even outdoors on terraces and patios to give you a burst of warmth on a cool spring or autumn day. 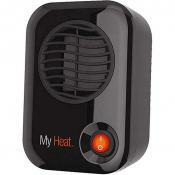 As for the power, a rule of thumb is that you need about 10 watts of power to efficiently heat up 1 square foot of area. Thus, a 1500-watt heater (which is an average wattage most units will offer) is intended for a 150-foot space. However, in reality, no two 1500-watt units are alike and the heating area will also be determined by technologies and features this or that model comes fitted with. You need to be sure the heating appliance is not dangerous and will not start burning when tipped over. Hence, a tip-over protection is a must. 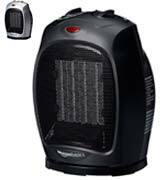 The best space heaters have an auto shut-off mode to prevent overheat as well. So, even if you forget to turn the appliance off, no fire will start. Basic features that make the appliance use easier and more convenient include carry handles and wheels, oscillation option for even heat distribution, fan mode only to blow out cool air, a programmable timer to set an operation period, and an adjustable thermostat along with adjustable power level settings to tweak the heating performance to your needs. 1. 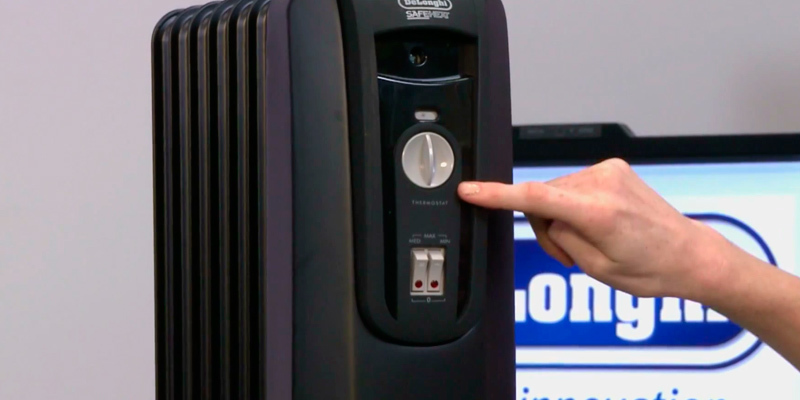 Space Heater Buying Guide, Consumer Reports. 2. 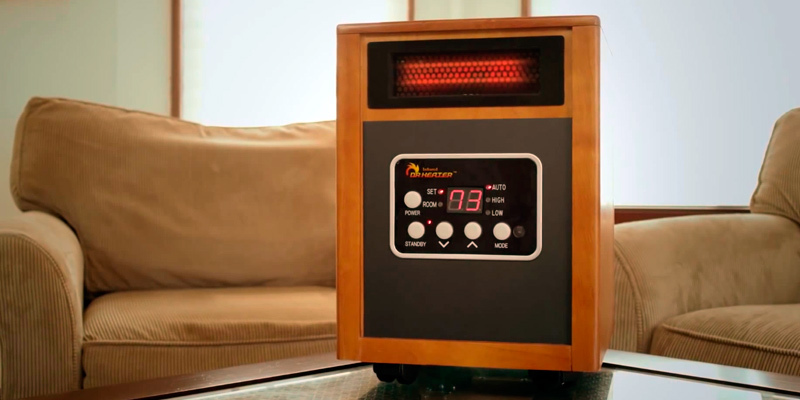 How to Pick the Best Space Heater For Your Heating Needs, ApartmentTherapy. September 1, 2012. 3. Your Guide To Choosing The Right High Efficiency Electric Heater, eBay. May 21, 2015. 4. 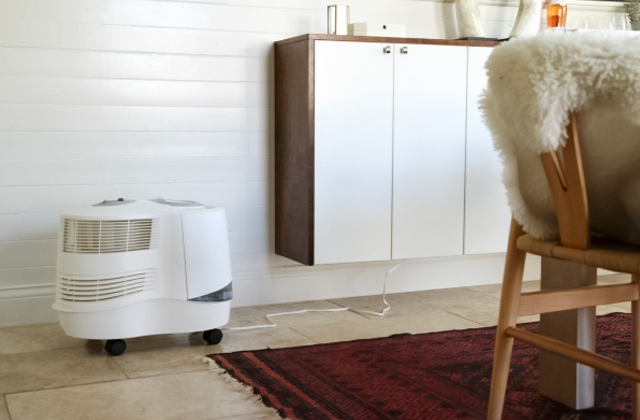 Choosing a Room Heater to Fit Your Lifestyle in 3 Easy Steps, Air & Water.